Sometime during Nola's sixth year I decided to foster another dog, Buddy, so that Nola could have a chance at some canine companionship (I was a bit misguided, but I'll have to explain that in an upcoming article). Now Buddy had an uncontrollable urge to chase anything that was moving (which was a problem if he happened to slip his lead, as we lived in the middle of the city), and for whatever reason, no matter what I tried, I just couldn't tap into this primal urge of his to...make prey. On everything. It was back to Google for me, to try and find some solution to the problem. That was how I stumbled upon Kevin Behan's website. Everything I read on his site made sense, not just in terms of how he explained dog behavior, but also in the way that his ideas just resonated with me on some core level. What he described was a way of tapping into a dog’s deepest instincts and seeing the world through their eyes (or, more accurately, feeling the world through their heart). Rather than looking for ways to suppress a dog’s natural energy, he spoke of channeling it into obedience behaviors. He had redefined (for me) how to harness a dog’s social energy, and I wanted to find out more. So where’ve you been? Has your son arrived yet? And how about this dog training stuff? Dog Training: Eleven essentials that all children (and adults) should know about dogs. How to play tug of war with your dog - and have the happiest dog on the block. Dog Training: How to be calm, assertive, AND relaxed - be the moose! My second dog was a 6 week old terrier mix. I did just about everything wrong with her, but she was a terrific dog regardless, if you didn't mind her skull splitting bark. I read every dog book I could find, starting with the Monks. We went to basic obedience class, which the instructor very graciously had us take twice. I never made headway on her bark though, and every once in a while she would head for the hills if the opportunity presented itself. I decided the dog was the problem (how humiliating to see THAT in print) and got myself a lovely German Shepherd (in addition). 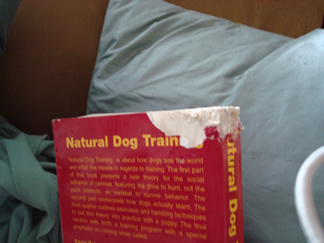 This is where I started boring my friends with my latest obsessive dog training reading. I can't believe they stuck it out with me. My life revolved around this dog for two years. I did a lot of ball work with her and read Kevin's book around this time. We walked 5 miles every day, we practiced tons of socialization. She was reactive though and just a handful. I felt like a failure and was considering finding her a place on a farm where she could just be in perpetual motion. A friend talked me into spending a bootcamp weekend with April Frost, author of "Beyond Obedience" here in Vermont. It was PART A of a relationship changing experience for us. I have a lot of respect and admiration for the work that April does. All of a sudden I had a dialogue with my dog, it was great. But it wasn't everything. I wanted to have off-lead experiences. PART B finally brought me to Behesha (Grist) Doan who teaches remote collar training. After a bootcamp with Behesha I spent a week with Martin Deeley learning his method of the ecollar, and watched his phenomenal retrievers in action. It was at Martin and his wife Pat's place (they are both terrific trainers and extremely supportive) that I was really forced to confront my biggest issues with training: I need to manage my own adrenalin and nervousness, and at some point you have to choose what to believe in. Every one is convinced that their method or approach is best and I just kept bouncing around, always feeling like I made a bad choice, or was missing out on something or had to be apologetic for which methods I chose. I also was a chatty, nervous person when other people were watching me. I was refused entry to an agility training group because I use the ecollar, and they were particularly nasty about it - the politics of dog training is unpleasant and ignorant at best. I'm finally letting go of that, along with the stigma of remote collars. I spend hours each day working with my dogs, I love watching them and I use everything from treats to tugs to balls to chase games to the ecollar. I adopted a very mellow"perfect" dog after my first GSD died. I started fostering rescues and helping people with their dogs within the past three years. My observation skills have improved tremendously and each dog that has come my way has taught me a lot, if I've been willing to keep an open mind. I just now have a third dog, another rescue, he is a challenge, lots of fear issues with people, very reactive. I love the clarity of his body language though and I'm taking all of my leads from him. He's undergoing heartworm treatment so he needs to be very low activity for the next (gulp) 10 weeks. I've started laying tracks for him to keep his brain busy. I am extremely interested in learning Maryna Ozuna's method of bodywork with dogs. I think a lot of behavioral issues are aggravated by physical discomfort, particularly in aging dogs. I am also hopeful that I can learn more about Kevin's work and observe, take a seminar or spend time at his place. I'm taking a one day workshop with Margot Woods who uses remote training collars, in August. Learning to be in the moment has been a big lesson for me and is still in progress. I've spent most of my life as a graphic designer, which is always about the next deadline. It has taken me a while to untrain myself, but it is feeling great. Regarding the bodywork...yes, I'm very curious about that as well. In fact, I had dialogued some with a TTouch practitioner (someone certified - I've read the books, but am no experTT by any means) about working together, but it just didn't happen for one reason or another. The physical component, with dogs, is SO important, because they are a physical conduit for the emotional energy that the world is sending through them. A relaxed dog can easily handle lots of stimulus, while a tense dog ends up...well, like a narrow pipe with too much water going through it, bursting. To varying degrees. In fact, I really view the basis of my work as essentially helping dogs relax (especially "problem" dogs) at higher and higher levels of stimulation. It's interesting too that you mention your own anxiety/adrenaline when it comes to working with dogs, and being observed. I find that one of the most difficult things as a trainer has been helping dog owners relax, breathe, fostering that quiet, observant mind. When we get nervous our tendency is typically to "turn the volume up" either extrovertedly (with action/words) or introvertedly (with thoughts) - neither of which being very productive. While the more we can relax, the more our dogs can relax, and everyone can get to the business at hand. You've probably even seen some of Kevin's writings where he's talking about how he feels that a dog's issues are reflective of the issues going on with their owners. So, to the extent that you believe in this sort of thing, I've often found it helpful to ask the question of "what lesson is this 'x' that I'm experiencing with my dog supposed to be teaching me about my own emotional experience?" You may or may not be surprised at how many times the process of answering that question has resonated with my 'human' clients. The politics of dog training: let's just say that I am making it my goal to deliver information, as it's worked for me, to the best of my ability - without an axe to grind or something to prove. So, with that in mind, I'll have to look more into the other trainers you've mentioned. It sounds like you're in a place where you have become more grounded in what methodologies work for you/resonate with you, and I'm sure that has made the hugest of differences in your work with your dogs. I'm still working my way thru your site . . . we had one dog growing up, a Sheltie, whom my parents adopted when he was about 5, and he was a bit of a neurotic mess but I loved him anyway. He of course had absolutely no training -- who trained in those days? I've always had cats, tho, and am considered something of a crazy cat lady. However, I'd wanted a dog for years. But I had 2 elderly cats with kidney disease by the time I was in a position to have a dog, and one hated all other animals, so we waited until she was gone. Our first trial adoption was with a dog with all sorts of issues: either dog aggressive or extremely protective of me, he drink huge amounts of water & peed frequently, but was housetrained; he wasn't diabetic, but we didn't have him long enough to get to the bottom of that issue. The reason we didn't adopt him was his extreme separation anxiety. I just didn't feel I could handle all that in my first dog (one I'd waited 20 years for! ), and even then it was terribly hard to give him up. When my elderly cats first got sick, I started to think a lot about causes, and just became fascinated with animal behavior in general. I'd always loved animals, but taken them somewhat for granted. When we got kittens, after a year, I got interested in agility and started to clicker train them! I think it's interesting about Kevin thinking that our dogs' issues are ours. Certainly I think there's truth to that. However, we had Chester, our first dog, since he was about 10 weeks old. He's a great dog, and while he did have separation anxiety too, we worked thru that. He's not in the least reactive; he gets along great with all dogs (altho he'll be reserved with a big dog til he knows they're nice -- he's a chihuahua mix), and all people, including kids, even tho we don't have kids. After a year, we adopted a second dog. Lola was 10 months old when we got her. She'd been bounced around to at least 6 different homes in that time, and had absolutely no training. She is very reactive. Oddly enough, she wasn't when we got her. She has adored Chester from the moment she set eyes on him. She loves our friends' Westies. And she does usually get along with other dogs off leash . . . but on leash she's very reactive. She'd really never been walked on leash before we got her (she's also a chihuahua), and I don't think she was well socialized to dogs despite living in a home with a cat & a dog at one point, altho she's extremely well socialized to humans. I've worked hard with her, and she's made a lot of progress, but she's still reactive. So, is it a case of nature vs nurture? As I said, Chester isn't at all reactive; Lola is -- but we had Chester from a tiny puppy, and Lola was almost an adult when we got her. And thankfully, Chester hasn't picked up on her reactiveness, either. They both do agility, and Lola is pretty good in class, surprisingly. I was worried about her, but she loves it and pretty much leaves the other dogs alone, rarely even growling at them. I was so pleased the day one person in class said "oh, your dog has a problem with other dogs?". Still, like you were with Nola, we're not all the way there.